– there was a panel of five who spoke: Fabienne Morgana, Glenys Livingstone, She D’Montford, Gede Parma and Linda Ward – each presenting their work and experience. Below is the presentation by Glenys Livingstone. I have named what I do as “Poetry” – it is “re-creating Gaian Poetic sacred practice”. It allows for the bringing forth of a world – something ever-new, as well as the bearing of a tradition. The tradition that I speak for is PaGaian Cosmology – I am its author, and it comes out of a particularly Southern Hemispheric viewpoint, that is, the perspective of a European person transplanted, whose indigenous heritage from her Northern Hemispheric ancestors was forgotten, buried, yet latent in her bodymind. I felt torn between identifying my proposal for the Parliament as “Pagan” or as “Goddess”, as my practice splices both together – expressed in the word “PaGaian”. I have always been more clearly in a “Goddess” camp for the 3 decades that I have been coming to know and practice an Earth-based tradition, my first teacher being Starhawk. My primary search was for female metaphor for the sacred, and then for ritual related to the Seasonal Moments of my place … the expression of Her Creativity, and conjuring that Creativity in myself. There was a time, and there still are places where it doesn’t have to be, and actually is impossible for it to be, a choice between “Goddess” and “Pagan”. She was once the Land and the Land was She, AND one’s being was/is not separate from the Land, the Habitat. The Place is who I am. Some cultures don’t need the word “Goddess” … globally there is evidence that indigenous traditions know female sacrality, be that expressed as grandmother spirits, or with vulval or female based metaphor. The Female is revered, and regeneration expressed in terms of female metaphor, but most on the planet these days do not live in such a context. So “Goddess” seems a necessary word. There may be better words such as Madre Dea, Devi from Sanskrit, Divya, same root, means “radiant” in the Indian goddess litanies, Tia-mat (Goddess Mother of Babylon). The word is Dione in Old Greek and Diana in Old Italian, Dzewanna in Polish and Dzine in Romanian, both late derivations from Diana, and is the basis of diva, diosa and via Latin and French into English “deity” and “divinity1”. She is actually at the base of human understanding of Deity. “Pagan” as I understand it means a person “of the country”. It is related to Place and it is a place that is Native … and we are all Native. “Place” these days could and perhaps should, mean/ at least include Gaian/Planetary and extend not just to the Planet but to Cosmos as well. While at least in the Northern Hemisphere when my ancestors had lit candles and sang at the Winter Solstice, though they called it Christmas, there remained a resonance with the land, a memory of something earlier upon which this ritual was based. In the Southern Hemisphere, there was no such resonance of the religious practice of the Europeans with Earth; and the children here of this religious practice inherited a poverty of spirit, a deep divorce from Earth that few other religions in the history of Gaia have ever known . The fact of my context being thus – the Southern Hemisphere – has contributed in the past to my deep sense of being “Other”, yet hence in the present, this context contributes to my deep awareness of the reality of our Gaian “country” – that the whole Creative Dynamic happens all the time. The “Other” is always present. Many in the Northern Hemisphere have no idea that the Southern Hemisphere has a “different” lunar, diurnal, seasonal perspective, and therefore there is often a rigidity of frame of reference for place, language, metaphor and cosmology. Indeed over the years of industrialized culture it has appeared to matter less to many of both hemispheres.There is consistent failure even amongst Earth-oriented writers, to take into account a whole Earth perspective. A sense and account of the Southern Hemisphere perspective with all that that implies metaphorically as well as sens-ibly, seems important to comprehending a whole perspective and globe – coming to inhabit the real Cosmos . The term “PaGaian” suits my practice. It combines a clearly female metaphor with ancient roots, embraces recent scientific perception of our Habitat, and it is grounded in indigenous Western celebration of the Earth-Sun annual cycle. And further it is a “Cosmology” because it is about this Place, this Cosmos in which all are situated … it is not a “theism” of any kind. Another teacher of mine, Thomas Berry, identified himself as a “geo-logian” for a similar reason. I have been coming Home to what I regard as my indigenous heritage – not taught to me in a whole piece, because it couldn’t be: I was in a new context. I have had to rely on what I could remember – bits and pieces, and some good teachers who always assured me that it was IN me as much as anywhere. I have been an inventor out of necessity. And the Universe has come up to meet me. 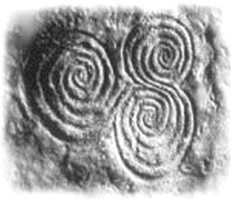 This image is dated at 2400 BCE from what is known as “Newgrange” in Ireland – Bru-na-Boinne is its indigenous name. It has only recently come to light again after millennia of being covered: I can identify with that. And it has been impressing itself upon hearts and minds around the globe, including my own. It has multivalent meanings, and one of those is the three faces of Goddess, most likely by the names She was known in that place. But She may – and does – have many names. I have come to understand these three faces – Young One, Mother and Old One – as Cosmic Dynamics. And I have augmented my understanding of them with Thomas Berry’s three faces of Cosmogenesis – three qualities that he perceives as essential to the Creative Unfolding of the Cosmos. He named his three as differentiation, communion, and autopoiesis. Differentiation – identified with Virgin/Young One aspect … to be is to be unique. It is the Universe’s “outrageous bias for the novel” (Swimme and Berry p.74) . It is the differentiated parts – the love of Self, the particular. She is the Urge to Be. Communion – identified with the Mother aspect … to be is to be related. It is “… the primal togetherness of things” (p. 78). It is the whole, the love of Other, the web of interaction. She is the Place of Being. Autopoeisis – identified with the OldOne/Crone … to be is to be a centre of creativity. It is “the interior dimension of things … the power each thing has to participate directly in the cosmos-creating endeavour.” (p.75). It is the hidden sentience within. It is love of All-That-Is, the Larger Self. She Who creates Space to Be. 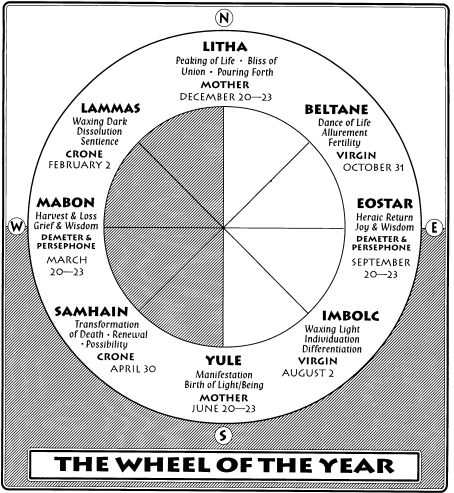 WHEEL OF THE YEAR … the dates are for the Southern Hemisphere. A map of how I and my community celebrate these dynamics of Creativity in the Seasonal Moments. Essentially it is a celebration of Self, Other and Cosmos – with personal, cultural and ecological story. It embodies a powerful pattern of Her Creativity. the light phase celebrates the Young One – new differentiated being, manifest form – visible reality that we can touch. .
the dark phase celebrates of the Old One – the dissolving creative return to the Dark Mystery whence all emerges, manifesting – invisible, non-visible reality. the Solstices are celebrations of the Mother – the fullness of dark or light, the birth of one or the other. The Solstices celebrate the relationship that this Place is – between the “manifest” reality (of light) and the “manifesting” reality (of dark). They are Birth Places, and may celebrate the Sacred Interchange or Union – communion. The 2 Equinoxes are points of balance – in the middle of both the Dark and the Light phase – celebrating the Sacred Balance of all three. I celebrate the Equinoxes in the ancient tradition of the Demeter and Persephone story – the Mysteries of Eleusis. Livingstone, Glenys. PaGaian Cosmology:Re-inventing Earth-based Goddess Religion . Lincoln NE: iUniverse, 2005. 1 The source for the etymology of the words in this paragraph was Max Dashu during her on-line course, Spiritual Heritages of Ancient Europe.